Robert De Niro‘s second film as director is methodical, atmospheric, and very well acted. It is also a long, hard slog. 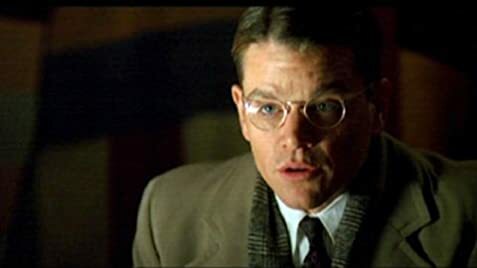 Ostensibly about the origins of the CIA through the eyes of altruistic Yale Skull and Bonesman Matt Damon, we watch as his sensitive poetry student becomes a soulless spy master, bringing dread and calamity to all he loves while doing the dirty work of the agency. I like Matt Damon. He is perpetually ignored or overshadowed in films where he delivers. He was the engine of The Talented Mr. Ripley, yet all of the good notices went to Jude Law. He was the most interesting character in The Departed, but the buzz went to DiCaprio, Nicholson and Marky Mark. He was the best thing about The Martian by far, so good that when you left him on the lonely planet to check in with all of the smart, hip, “every day is casual Friday” types at NASA, you quickly became bored. Here, he is again very good, even though you sense he is shadowing Michael Corleone, becoming more brittle, more shallow, and more sinister as each scene progresses. Yet, even at his most unconscionable, Damon gives you a glimpse into his tender and sensitive side. His scenes with his son, both as a child and as an adult (Eddie Redmayne) are touching. It is a very strong performance. The story itself is also intriguing. The theme of the lure of patriotism and secrecy to the yearning and vulnerable Damon is well-developed, for a time. Unfortunately, the film is over long and eventually, repetitive. Characters tell Damon on at least half a dozen occasions “trust no one” or something to that effect, a sentiment that hardly needs to be verbalized when every single scene in the film communicates that you really shouldn’t trust anyone. Still, this is a pretty decent flick.